The biltong lovers paradise where all your carnivore wishes come true! We have all the popular flavours at amazing prices. Our range includes Biltong Sticks, Sliced Biltong, Chilli Bites, Original Bites, Dry Wors, and Beef Jerky. We take great pride in producing biltong to the best of our ability and each step of production is a careful process from slicing the beef, roasting the spices, slowly marinating and finally air drying to perfection. All our flavours are packed in a variety of sizes and we also sell Variety Packs, including all our popular biltong items. 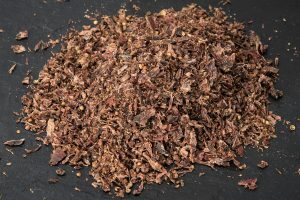 We only use the best cuts of beef and spices available to make our biltong. All the spices used are bought fresh and dried or roasted accordingly, thereby optimizing freshness and taste. We do not use any artificial preservatives, nitrates and absolutely no ‘E’ numbers are involved in the process. All our biltong is freshly made and vacuum packed or gas flushed to seal in freshness from us to you! We do not produce large quantities, because we believe in producing smaller top quality batches.